It sounds great in theory. 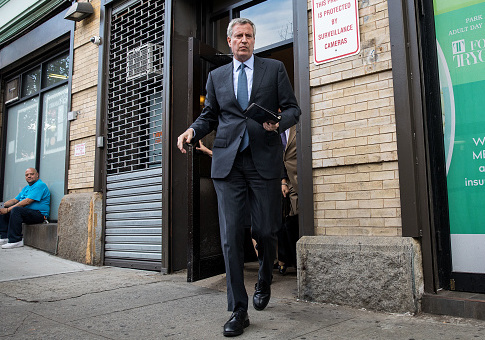 Six hundred thousand uninsured New Yorkers (half of whom are illegal aliens) will get guaranteed free health care, through a "compassionate vision" put forth by Sandinista sympathizer Bill de Blasio. They'll even get a dedicated membership card and a hotline! In reality, it will probably go about as well as the New York City Housing Authority—especially given that de Blasio's proposed $100 million budget comes out to $167 to cover health care costs of the uninsured per year. "Everyone is guaranteed the right to health care, everyone," de Blasio said. "We are saying the word guarantee because we can make it happen." New York also promises 400,000 low-income residents "decent, affordable housing." By decent, they mean apartments riddled with "mold, roach infestations and labyrinthine rat burrows." The public housing authority is in such a state of "crisis" that the federal government might have to take over. "Entire housing developments are overrun with rats." Tenants deal with "water damage, falling plaster and windows that could not close in the Bronx River Houses." Private landlords have had to come in to clean up "crime, filthy stairwells, moldy walls, rodents and cockroaches." City government managers have engaged in "systematic misconduct, indifference and outright lies." Apartments have "unreliable heat in winter," and federal prosecutors say mismanagement has endangered tenants for years, including at least 820 children being exposed to lead paint. The city has $32 billion worth of outstanding repairs, including "$5.6 billion to fix kitchens and bathrooms; $2.9 billion for apartment floors; $3.1 billion to repair mechanicals like boilers, pipes and radiators; and $1.5 billion to fix elevators." Federal prosecutors say the problems "reflect management dysfunction and organizational failure," the New York Times reports, and a "culture where spin is often rewarded and accountability often does not exist." De Blasio says he is "disgusted" and "angry as all hell" about the situation. Perhaps he should clean up the rat-invested hell holes that come from an existing major government-run public program before he embarks on a new one. This entry was posted in Issues and tagged Bill de Blasio, Health Care, New York City. Bookmark the permalink.